Diabetic foot problems are the most common cause of non-traumatic limb amputation. Life expectancy can be reduced by up to 15 years for people with diabetes. 15% of people with diabetes will have a foot ulcer at some point in their lives. Discolouration in foot, Ulceration, Blisters, Necrosis. Callus with signs of underlying extravasation, capillary leakage. Red areas, Swelling, Infection/Cellulitis, ↑ body temperature, Flu-like symptoms. Pain in foot or leg even in presence of neuropathy. Remove the patient’s shoes, socks, bandages and dressings and examine their feet. If initial X-ray unconvincing, use MRI. If MRI is contraindicated admit for white blood cell (WBC) scanning. May have heavy callus build up. Found on weight bearing areas of foot. Usually pedal pulses can be palpated. Can be deceptive as ulcer may penetrate to bone. May present with localised/spreading infection. Non adherent dressing to wound (± larger temporary shoe). Broad-spectrum antibiotic in presence of localised infection. Urgent admission for bed rest and i/v antibiotics if spreading cellulitis. Refer to podiatry for callus reduction, wound/footwear assessment and multi-professional management. Ulcers often located on borders of foot where there may be pressure from footwear. May be infected or appear necrotic/gangrenous. May require urgent vascular referral. Hot swollen foot, ± history of injury. Differential diagnosis to eliminate osteomyelitis. Gold standard to Dx is technetium bone scan. Treat as though diagnosis confirmed while awaiting definitive diagnosis. Non weight-bearing cast changed at weekly intervals until foot no longer hot and x-ray indicates resolution. Too rapid mobilisation can be disastrous and lead to further bony changes. 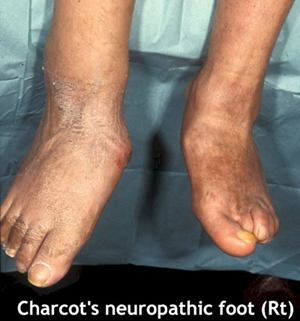 It is essential to differentiate between Charcot’s and cellulitic foot. Podiatrist CUH on site in OPD (next to fracture clinic) - Tuesday, Thursday, Friday. Content by Dr Íomhar O' Sullivan 11/03/2004. Reviewed by Dr ÍOS 20/04/2005, 19/07/2005, 29/05/2006, 29/03/2007. Last review Dr IOS 5/12/18.